The Little Salmon Carmacks First Nation is located in the community of Carmacks in the south Central Yukon along the Yukon River. Carmacks was an important stopping point for the many steamboats that travelled between Whitehorse and Dawson City during and after the gold rush period. The town takes its name from George Carmack one of the discoverers of the Klondike gold. The Little Salmon Carmacks First Nation people are part of the Northern Tutchone language and cultural grouping and are closely affiliated with the First Nation of Nacho Nyak Dun of Mayo and the Selkirk First Nation of Pelly Crossing, their Northern Tutchone neighbours. 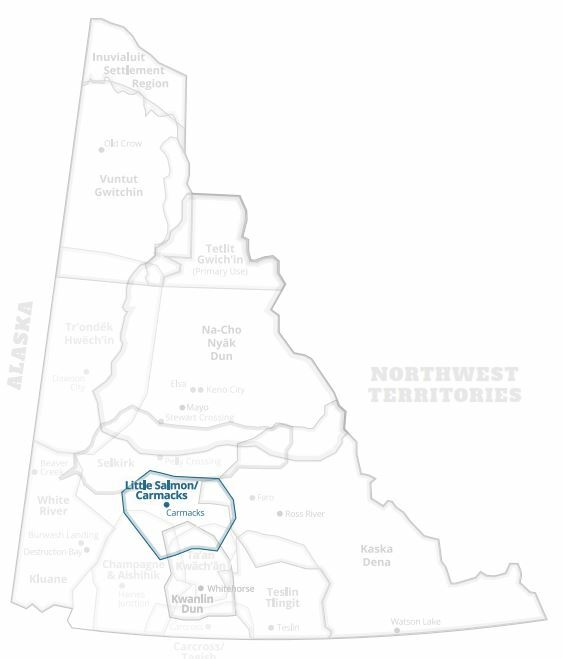 The three First Nations are formally associated through the Northern Tutchone Tribal Council, an organization which takes responsibility for some program and services areas of common interest and concern. The Little Salmon Carmacks First Nation became self-governing in July, 1997. The registered population of First Nation members is numbered at approximately 500, of whom half live outside the community. With their Land Claim and Self-Government, the First Nation now owns approximately 1,000 sq. miles of land and receives $15,568,239 over 15 years. With self-government the First Nation has the ability to make laws on its lands and on behalf of its citizens, and also has the option of taking over the delivery of programs and services for its membership. The Little Salmon Carmacks First Nation has returned to a more traditional form of government and now holds elections for the office of Chief only — members of the Council are selected by the respective Crow and Wolf moieties. Included on the council are an elder and a youth member selected by their respective councils. The Council is responsible for the development and governance of the First Nation and reports to the General Assembly, a group made up of all the membership, on an annual basis. The First Nation is currently involved in the planning and development of their rich natural resources that will benefit the people and at the same time enable the kind of capacity-building that will help to build a strong and self-sufficient First Nation.